It’s storming outside. In January. Even more than snow, rain makes me want to curl up with a good book or a cozy project, and so it seems appropriate today to share a knitted rug. 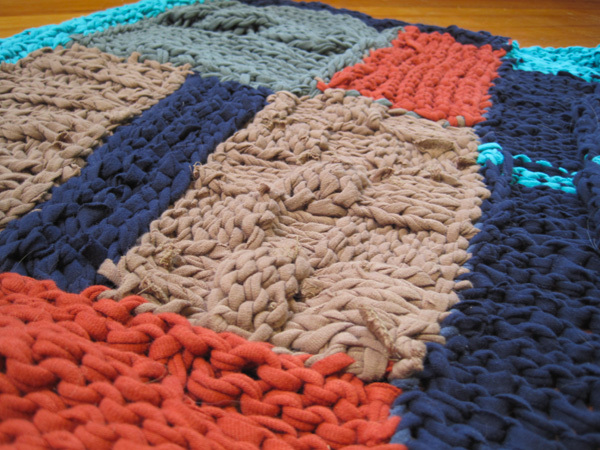 Even though this throw rug didn’t become anything beautiful, there’s a certain charm in its imperfections. Its knottiness and uneven stitching are nice to walk over and the spring in the knit cotton is soothing. Plus, it’s made from t-shirts. My collection of old t-shirts constantly needs to be thinned. I cut them up and use them for dusting, dishes and as mop pads. I make dog toys out of them and market bags. But still my collection seems to grow. Because I like to give things the chance to live as many lives possible, I found a few t-shirts in my stash with colors that seemed to work together and spent a few evenings mindlessly making t-shirt yarn. Then I spent another few evenings knitting up squares and rectangles in all sizes and colors, using whatever type of stitch seemed like fun. And the good thing about using squares and rectangles is that, like a game of Tetris, this rug just kind of fell into place. And what didn’t fall perfectly in line, I stretched. Like I said, totally imperfect, but isn’t it sometimes nice to see that something was made by hand? This rug was actually inspired by the lovely one you gave us for our wedding. 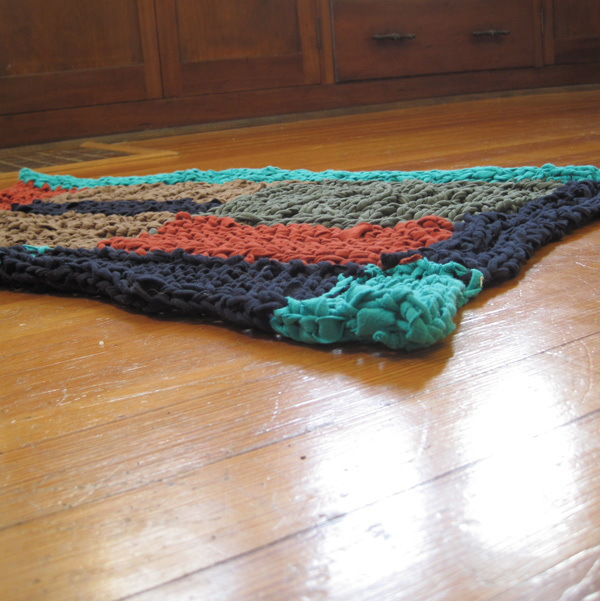 I wanted more color and scrap around the house, but failed to achieve the neatness of your rug. For the t-shirt yarn I cut the t-shirt in a continuous spiral and the thickness of the yarn depends on the heft of the shirt and the finished project envisioned. If it’s a really flimsy shirt I like to cut about 1/2 inch to even an inch wide. If it’s a thick t-shirt, I tend to cut 1/4 inch or so. I usually do it with a pair of scissors, cutting continuously thinking that was the only way to avoid sewing pieces of the yarn together, but there are some geniuses out there I’m finding. Just found a bunch of tutorials like this http://www.spiritedshannon.com/2011/08/t-shirt-yarn-tutorial.html that allow you to be quick, even and cut a continuous piece.